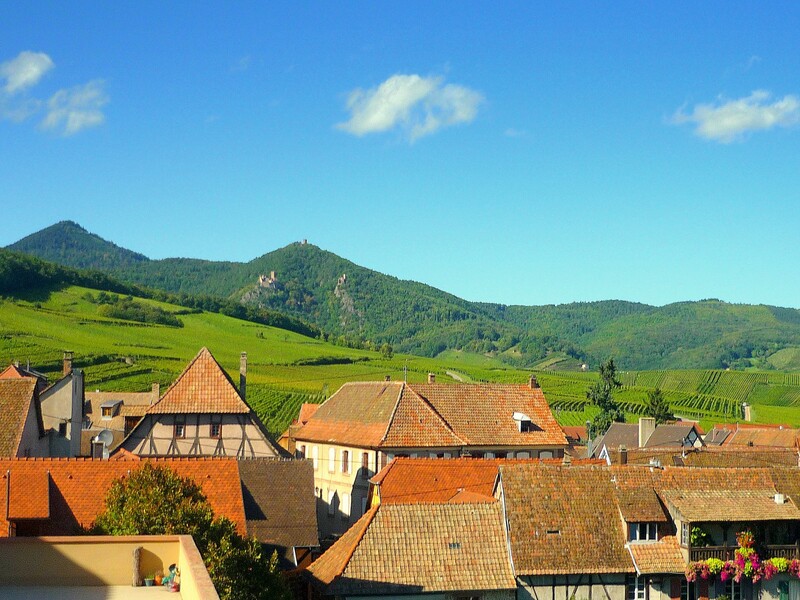 Nestled just outside the main thoroughfare, Hunawihr, hidden amongst the vineyards producing Riesling wines, is one of Alsace’s most charming villages. 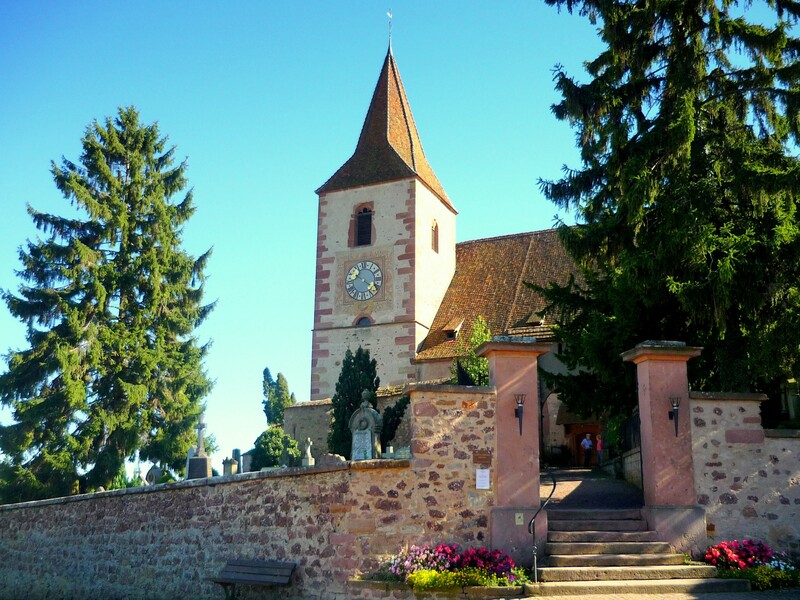 Hunawihr, listed as one of France’s most beautiful villages, is renowned for its iconic fortified church which is perched on a little hillside overlooking the village, the vineyards and the Alsace Plain. The name of Hunawihr derives from the legend of St. Hune (or Huna) who was the wife of Lord Hunon. St. Hune was renown locally for her generosity towards the poor and the sick. She died in 679 and was canonised on the 15th April 1520 by Pope Leon X at the request of Duke Ulrich von Wurttemberg. Her relics were scattered by the Protestants in 1540. 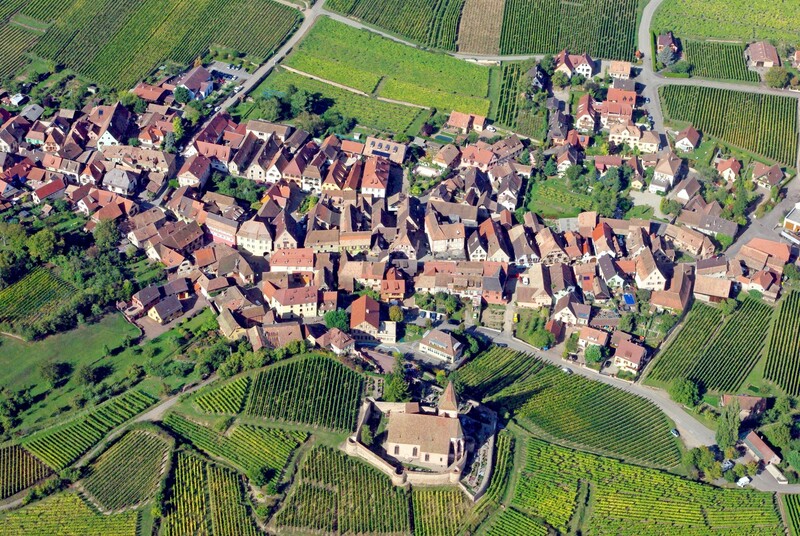 The village does not host as many visitors as neighbouring Riquewihr or Ribeauvillé and it is relatively easy to stroll up and down the narrow streets without feeling lost in the crowd. There are some very fine half-timbered houses in the Renaissance style in Hunawihr, many of them called “maisons de vignerons” (vine-growers’ houses), recognisable by the presence of a gate. These houses have been built using traditional materials found in many parts of Alsace: skilfully laid beams, flat scale tiles (“beaver tails”) and white or coloured roughcast walls made from a mixture of clay and horse hair. A few vine-growers’ houses offer tastings. 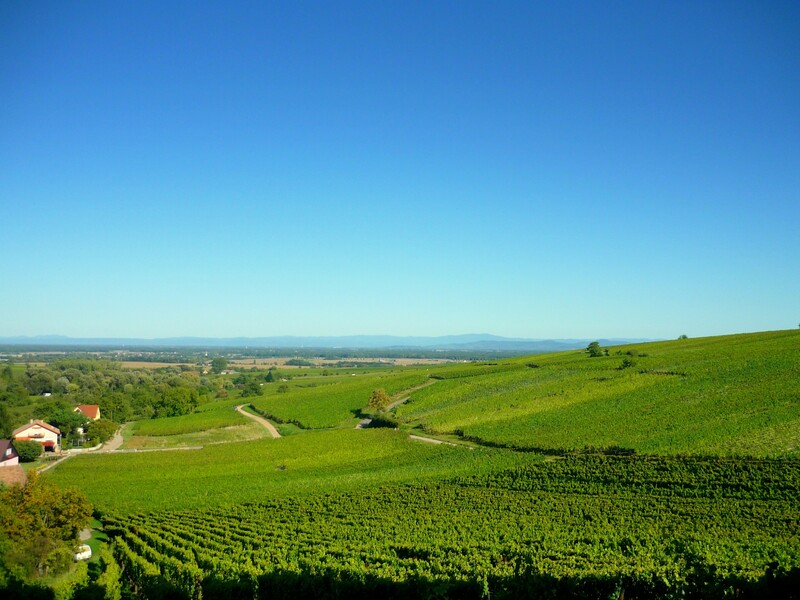 Hunawihr is renowned for the white wines which are produced here such as the Grand Cru Rosacker. One of Hunawihr’s oldest houses is the 16th century Town-Hall. This picturesque building housed the corn exchange market (Halle aux blés) before the Revolution. Built in 1517, the façade features the coat of arms of the Duchy of Wurttemberg (three black antlers) and those of the Duchy of Teck (a geometric field of diamond shapes) and the two fish of the Count of Montbéliard. 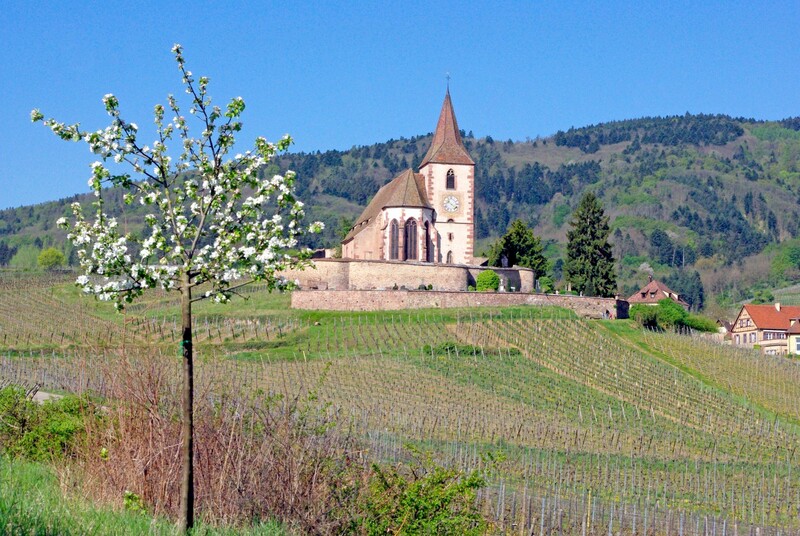 Hunawihr is famous in Alsace because of its fortified church, perched on a hillside on the edge of the village. 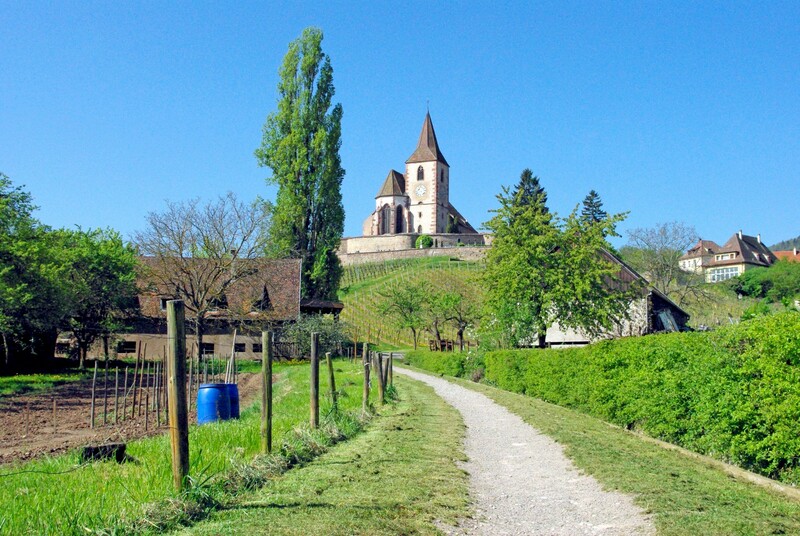 The fortified church of St. James (the Greater) and the old cemetery are surrounded by a 13th century wall which has only one entrance. The ramparts are still flanked by the six original semicircular bastions with ports through where guns could be fired. Listed as a historic monument in 1929, the existing church was built on the foundations of a primitive church from the 10th century. The square belltower of the church is as strong as a keep and dates back to the 15th century. The hands of the church clock are decorated with vine leaves, illustrating the importance of the vineyards to the economy of the village. 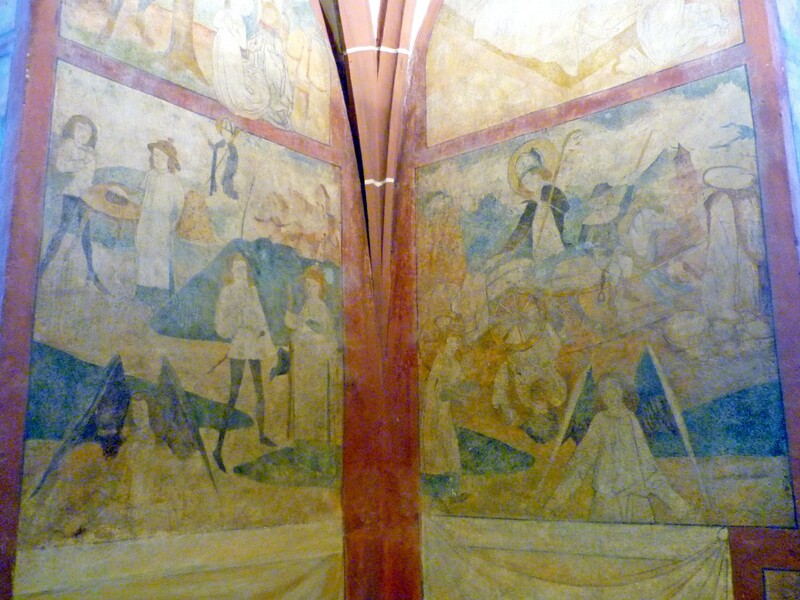 Inside are famous frescoes named after Saint-Nicolas which were rediscovered in 1878. The choir gallery, the transept and the nave all date back to the 16th century and the organ case to the 18th century. In the nave the 16th century pink sandstone pulpit set against the wall contains a small staircase crossing the pillar from which it is formed. 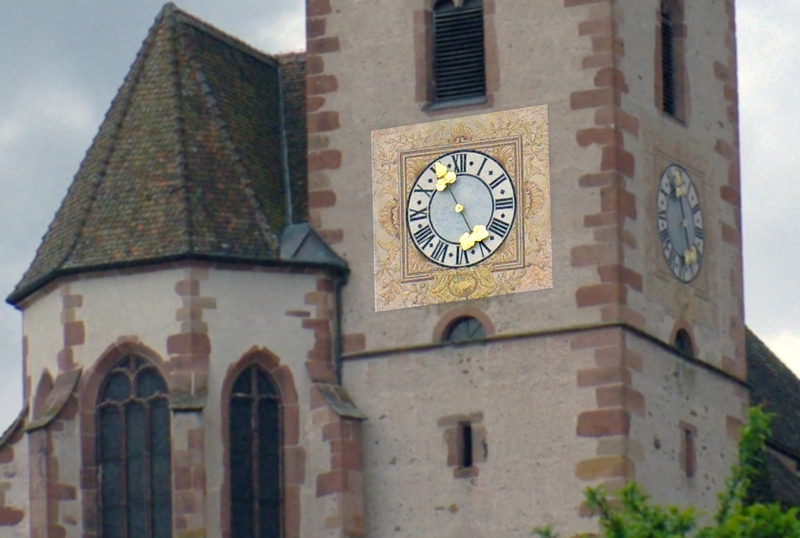 This setting is quite rare in France and unique to Alsace. 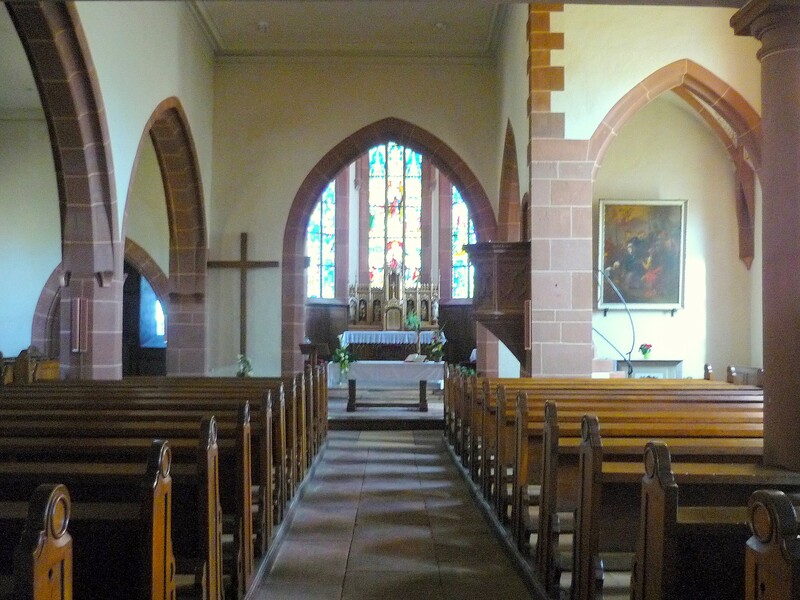 Unusually, the church has been used for combined Catholic and Protestant services for the last three centuries. Known as “Simultaneum”, this alternation of services held within the same church was introduced in 1687 by Louis XIV. The French king wished to preserve certain legal rights for Catholics to hold services in Protestant churches. A clause in the Treaty of Westphalia (1648) guaranteed religious freedom to the Protestant community in Alsace and provisions for the practice of Simultaneum were made in the Peace of Ryswick in 1697. It was determined than when seven catholic families were found in a village, they were permitted to organise a religious service in the Protestant church. 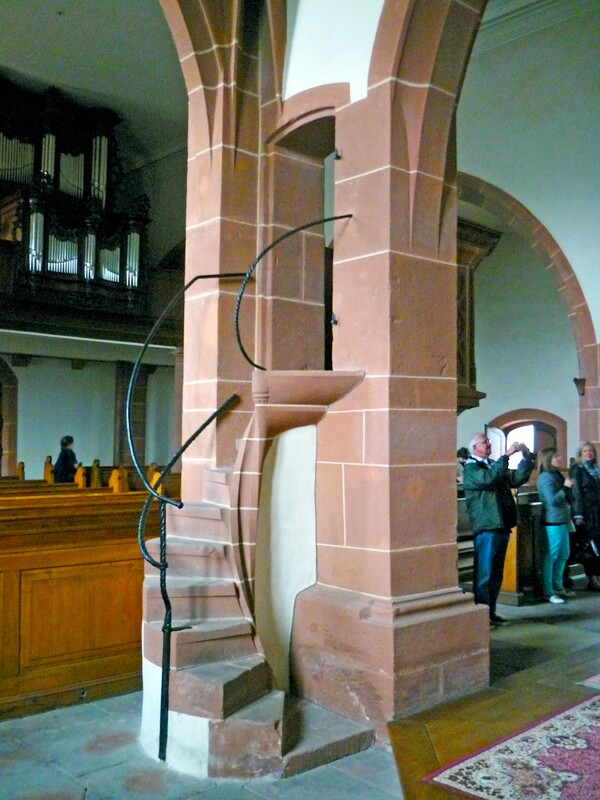 This happened in Hunawihr in 1687 when the choir gallery of the church was claimed for catholic services. The use of Simultaneum triggered many feuds and much humiliation and Hunawihr was the scene of clashes in 1753, leading to the imprisonment of the pastor in Colmar. 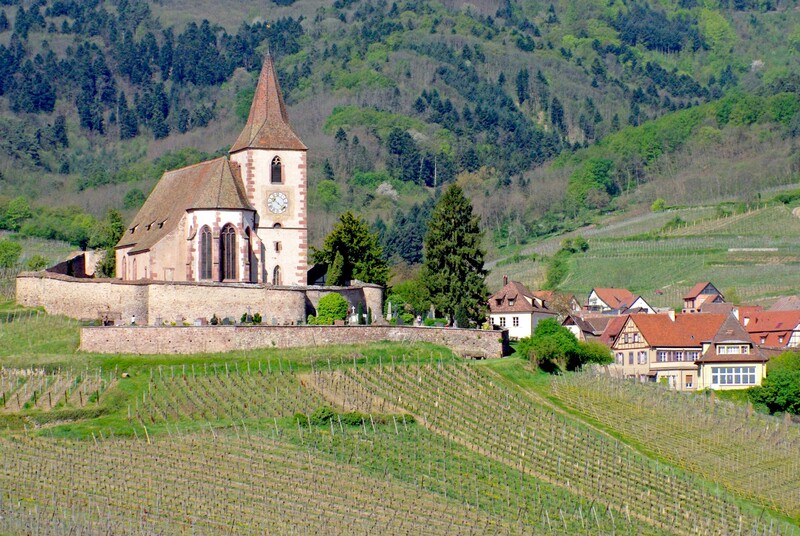 The view from the church is among the finest in Alsace. 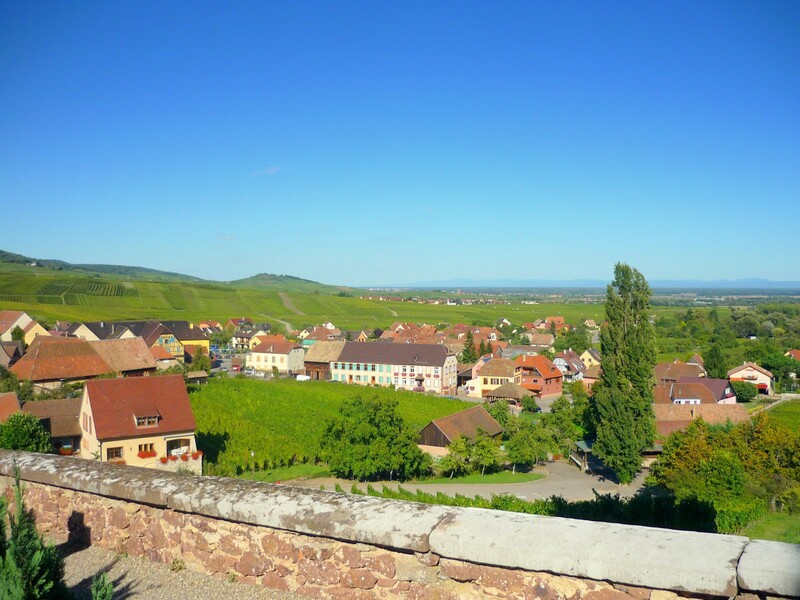 Like a picture postcard, the panorama stretches from the wooded hills of the Vosges down to the old and peaceful village of Hunawihr surrounded by vineyards, to the Alsace Plain, the vicinity of Colmar and beyond to the Black Forest. The 17th century fountain and wash-house located at the entrance to the village provide a fine view of the fortified church above and the three castles of Ribeauvillé in the distance. Just outside the village, two other tourist sites are worth a visit, particularly for families: the Stork and Otter Breeding Centre (Parc des cigognes et des loutres, which aims to reintroduce storks in Alsace) and the Living Exotic Butterfly Garden (Jardin des papillons exotiques), a botanical centre in which several varieties of butterflies can be seen in their natural environment.